Glamorous people many of us think of as “rich” are actually a tiny minority of America’s truly wealthy citizens—and behave quite differently than the majority. America’s wealthy seldom get that way through an inheritance or an advanced degree. They bargain-shop for used cars, raise children who don’t realize how rich their families are, and reject a lifestyle of flashy exhibitionism and competitive spending. 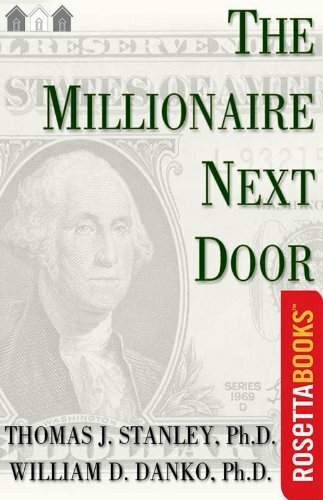 You may have heard of the book Millionaire Next Door by Thomas J. Stanley on the late 90’s. The book exposed the common quality of America’s wealthy people from 90’s to the 21st century. Most of the wealthy persona is found in a humble neighborhood in America, living the normal life in a normal house and raising their family in a normal and less complicated way. Learn the secret of how this millionaire avoids being in a spotlight and choose to be in the secret side while enjoying the luxurious life but keeping it simple. If you want to be a millionaire next door, then this book is for you.